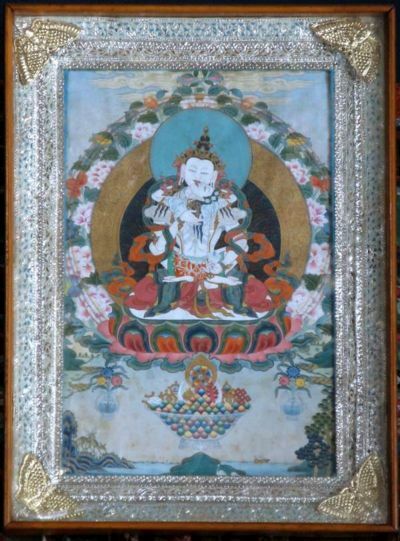 Vajrasattva (Skt. ; Tib. རྡོ་རྗེ་སེམས་དཔའ་, Dorje Sempa; Wyl. rdo rje sems dpa’) — the sambhogakaya buddha Vajrasattva is the sovereign of all the buddha families and mandalas. The lineage of Dzogchen is traced from the dharmakaya Samantabhadra to the sambhogakaya—the five buddha families and Vajrasattva, who are Samantabhadra’s own self-reflection. This is the mind direct transmission. In future, when I reach complete and perfect buddhahood, may those who have committed the five crimes with immediate retribution, or anyone whose samaya commitments have been impaired, be purified entirely of all their harmful actions and impairments merely by hearing my name, thinking of me, or reciting the hundred syllables, the most majestic of all the secret mantras! Until this is brought about may I remain without awakening! May I be present before all those with impairments and breakages of samaya commitments and may I purify all their obscurations! Due to the strength of these prayers, Vajrasattva’s enlightened aspirations are unlike those of other buddhas. In his nature, he embodies the hundred buddha families, the five buddha families and so on. Since he is the all-pervading lord of the hundred buddha families and the single buddha family of the great secret, he is unlike any other deity. You might go before each and every buddha dwelling in the ten directions and strive to apply the methods for confession, but it is said that is better still to practise confession by visualizing your own teacher, the one from whom all the mandalas emanate and into whom they are re-absorbed, indivisible from Vajrasattva. This page was last edited on 18 April 2016, at 08:37.